It may look like NNA but differs from it by ability to apply arbitrary commands to each note from start to end. 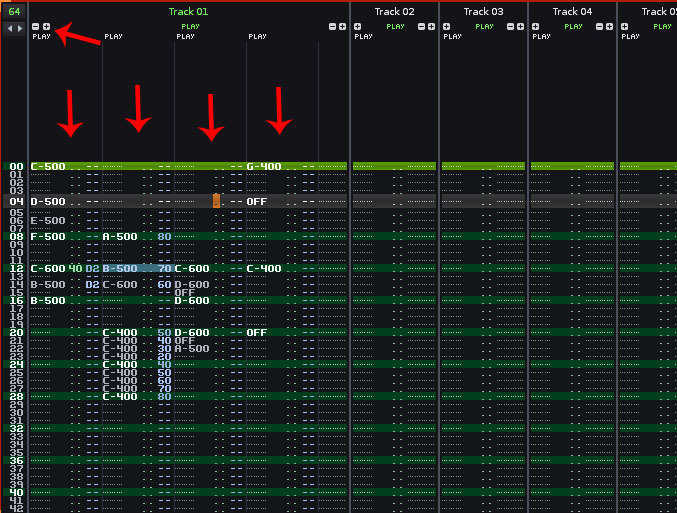 Note positions point onto separate track (or tracks if notes are many) where actual note is played with all desired effects. There can be launching of several notes at once from same position. Track, when activated, allocates free channel for playing. So it is something like midi sequencing - breaking a myth about opinion that midi sequencers are something professional whereas trackers are not. Further mental researchs will be put toward shifting from hard quantization and ticks to less bounded to hard frames, mathematically precise positions of notes and effects. Events - generally speaking. This will help to avoid redundant pattern's length, and will improve readability of patterns. It might help if you actually add some descriptive text about what you're displaying here. Cus so far it seems like something that exists already using NNA's. sounds like a combination of 3d trackers and midi, something I personally don't find very intriguing to look into (yet). What happened to just using a different channel for this? A channel is not bound for an instrument, and if you need 6 channels for an instrument, then why not just do that? Your suggestion is just a workaround, since you can't even group channels in OpenMPT, meaning that the module structure / logic is not very tidy. And workaround are often a bad thing, because that implies lacking functionality. I know, but since this is in General Chatter, and not in feature requests, I thought this is a discussion. This sound something like we have in Renoise implemented, and its quite handy for some cases. It allows you to open additional note-fields in the same channel, to have the sequencer like separate note control, and avoids the implementation of the "channel grouping" functionality. I'm using it for chords and in similar multi-note situations every time. To be honest, its really just a time saver/comfort factor, because this was you can setup a whole bunch of routing to 1 channel and just play all your notes and even different instruments from that setup. As LP said, you can always end up using separate channels for every note on "standard" tracker formats, this will have the same effect like a sequencer's multi-note pianoroll. It will surely need some additional routing/setup for every channel, and its not the most (visually) comfortable way to compose, but at least it works, and will definitely give you separate control. Nothing new on planet Renoise. That's what I call "grouped channels". It is, and its not. Its not channel grouping, as the term describes it, because it does not have that functionality. You sill have the channel's own automation, fx, and routing chain, it doesnt duplicates it for every extra note column. If it would do, you would effectively have multiple fully functional channels in the same track, which would be the "channel grouping". This only gives you ability to open extra note columns on the users demand, to have the pianoroll-like multinote control and overview, for every separate parallel note. You aren't having all the extra "channel fx" and similar features for each separate notes in this case also, as you can see. Think of it as a small channel extension, for users who only need to have multiple note control (that mimics real-life instruments? ), and dont need all the extra functionality, that a complete, separate channel would give them. Actually overlapping notes are bad idea, because it makes sound dirty. True ace uses clean sound, not fat reverberation or notes that overlap. But for the sake of freedom..... it still may be required. The only remaining problem with piano roll - it cant display 2 same notes. well i kinda dislike the pure piano roll display too, but renoise is "welding together" the two solutions, so we have tracker (were you can easily display 2 same notes) and piano roll features combined. But anyway, the main idea of the piano roll is to simulate a real, keyboard based instruments. You cant really press the same key, without letting it go first, now can u? I think "true aces" dont stick to (meaningless) rules, but compose from their heart. Music should be intuition based, so it can naturally evolve over time, not forced to any rules carved in stone. I surely agree, otherwise I would not begin topic. Manipulating frequency, notes, volume and rhythm can give you more clean, comprehensive and impressive sound than abuse of effects. I believe it relates to human's sensor system. As one cant eat too many kinds of food simultaneously, the same one cant listen too many diverse and unharmonized frequencies. Example: most interesting music had been written by Amiga four channel trackers. Still freedom is required at least for having "room to play".